1" = 25 mm Wide. One piece full leather handlacing braided belt. 7 Belt holes for a better fit adjustment. Leather covered buckle. Stitches around the buckle for a better grip. One matching loop. 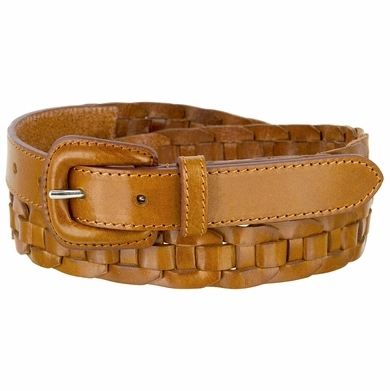 The belt comes in multiple colors such as black, brown and tan. Belt is measured from where the leather ends at the buckle end to the middle hole at the tip end. To get the best fit, order a size 2" larger than your waist size. If your pants size is 32", order belt size 34".